As you all probably remember, we first opened up our Social Room door to you guys at the end of July and since then the room has been becoming more and more popular among our students! BUT OUR Social Club as well as YOUR Social Space is about to get even better, which has us all buzzing with excitement at the office! As some of you may already know, we at WCE are devoted to making sure that you get the best experience out of your stay in Bournemouth and we are always here to help you. We are like one big family that just wants to get bigger! You were our inspiration when we thought up the ‘Social Club’ because we want you to also feel part of this family. Remember, we started off like you and we know setting up a new life in a new country can be a scary as well as a lonely experience at first. But with the Social Club and us it doesn’t have to be that way. So, what’s on at the moment? Currently, we offer English Language Skill Lessons every day of the week from 3:30 – 5:30pm, which are all held in our Social Room. 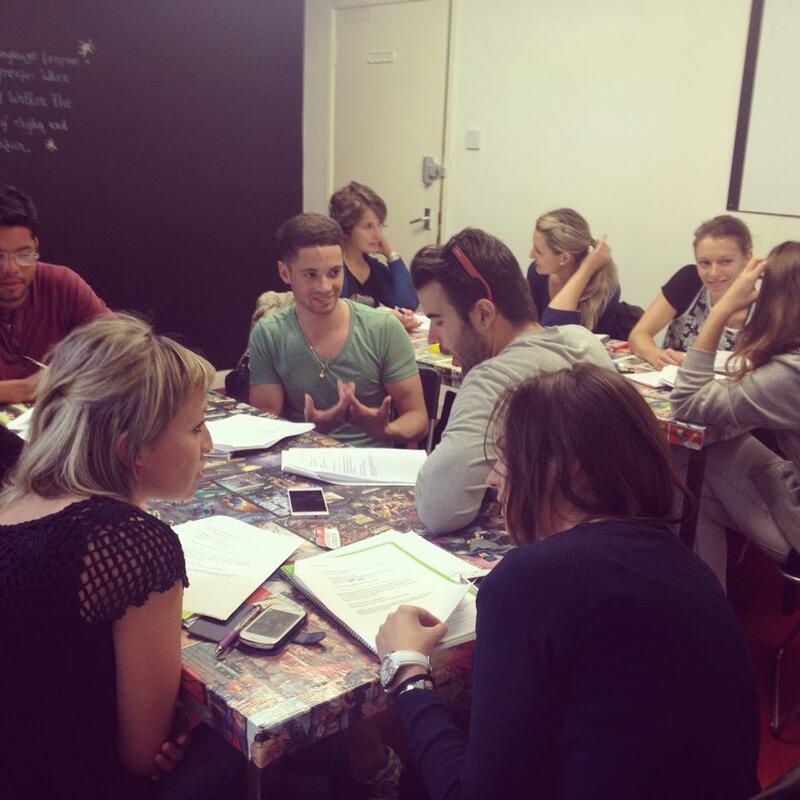 The objective of these lessons is to help you to improve your English skills in a friendly and relaxed environment. It’s a brilliant opportunity to meet new people who are all in similar situations. The Reading and Writing lessons, in particular, attempt to follow topics seen in the FCE curriculum so these lessons can also be seen as additional support for those sitting the FCE exam. On Fridays the lesson is based on aspects of British Culture because we believe that understanding the culture is just as important as the language. We also hold a monthly Employability Workshop, where we give you help with your CV and cover letter writing by providing you with some tips and templates. You can even bring your own CV to discuss it afterwards if you like. These sessions are normally held on Thursdays from 12 – 2pm around the third week of every month. Again, there will be an event set up on Facebook so you will always hear about it. We have also organised events to bring together staff and students, to socialise and experience British culture at first hand. Our first event was a ‘Tea Party’ at a sweet local dessert lounge and it was a success, as people socialised, laughed and chilled out with each other. Check out the photo from the event below and there are more photos in the Gallery section of out website. Doesn’t it just look fun? And we don’t just want to stop there; we have been busy brainstorming ideas for future events and more activities for our Social Room! What’s on in the near future? 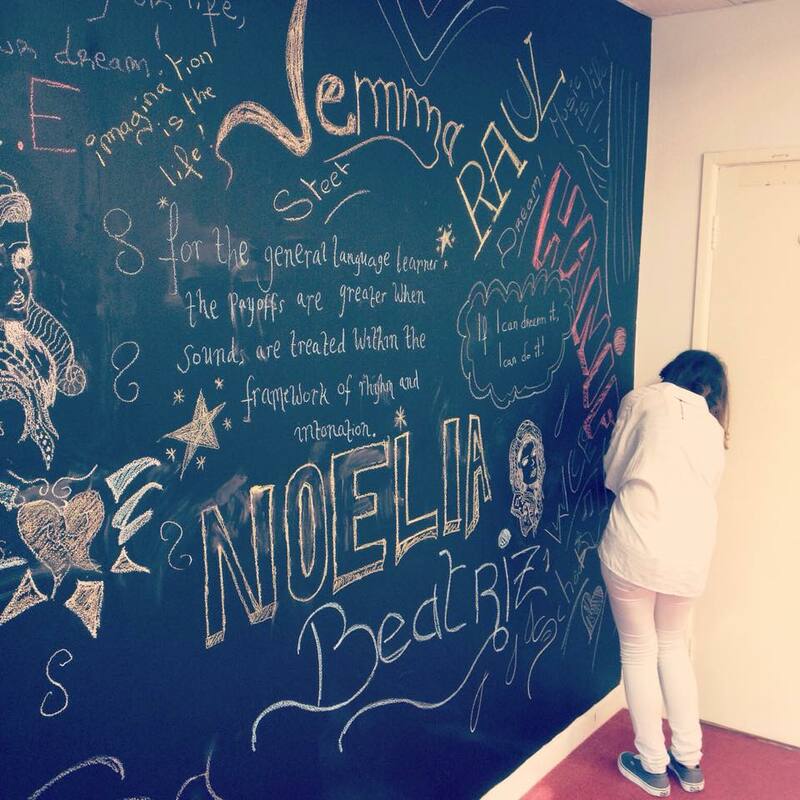 There has recently been a burst of creativity at the office ever since Inés, our creative intern redesigned our Social Room wall to make it look less plain and reflect the excitable personalities of our staff members. This has inspired us to get our hands creatively dirty for our Halloween event that will involve participants carving their own pumpkins! That will be held on Friday 31st October 2014 at 3:30pm, instead of the British Culture lesson, and you are all cordially invited! J We are also thinking of watching a scary film afterwards at the office, to make this Halloween truly spooky! Pumpkins, pizza, popcorn and a scary film – sounds just about right for this event! We are also thinking about having a game night and a film night on alternating weeks. The game night will consist of games in which you will have to speak to the other players, such as Cluedo. The films for film night will be chosen by you beforehand through an online vote out of three possible choices. These nights will probably be held on Friday night at around 6pm. However, this will be confirmed on our Facebook page so keep your eyes peeled! The idea of having themed weeks throughout the month to either support a cause or to celebrate our international culture at the office sounds brilliant and we are really hoping we can pull this off. For example having a week dedicated to Turkish culture and another dedicated to Spanish etc. We believe this will help our students feel like they are truly part of an international society. We are in England but we are WORLD Choice Education after all. By worldchoiceeducation in How we help you, Student Advice, The UK, World Choice Education on October 16, 2014 .